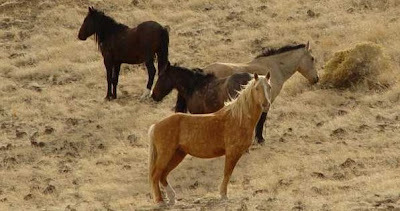 The end of 2007 found BLM removing wild horses from the Antelope and Antelope Valley Herd Management Areas (HMAs) to prevent “catastrophic loss of life”. The ongoing drought coupled with reports of wild horses numbering almost 1,200 forced BLM to declare an emergency gather to save them from starvation and protect the range. If that weren’t enough, traditionally the wild horses spend the summers in Antelope then migrate to Antelope Valley for the winter ~ except the Nevada Department of Transportation (NDOT) strung up a new fence up on Hwy 93 effectively trapping the horses and in one area, completely cut them off from any water at all. It’s almost a noble story and one that is often repeated; saving wild horses from dying of starvation and dehydration, protecting the range, wildlife, and ranchers ~ so much of the situation being out of BLMs control and leaving them very little options to preserve wild herds except by removals. While NDOT may have strung up a new fence, Mr. Hansen stated they never consulted with BLM before beginning and frankly, that’s very hard to believe. There are right of way issues requiring consultation with federal agencies and NDOT not even notifying BLM of a major fencing project that would destroy the Antelope horses migration routes is highly suspicious. Can’t prove this though…. 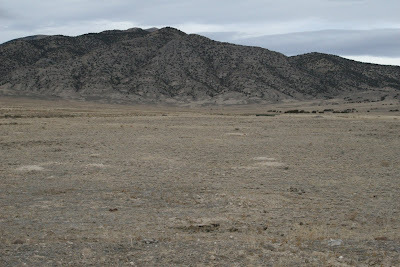 Somehow the Antelope wild horses not only managed to live a year in this before BLM announced the need for emergency removals, they were thriving according to the amount of foals being born. Yet despite 1,200 wild horses being counted in the area, not one photo BLM provided showed a single wild horse anywhere. It’s also interesting to keep in mind as you look at that photo that the wild horses are removed to protect the “thriving ecological balance” and prevent deterioration of the range. Then ask yourself, how much more deteriorated can it get? Yet BLM continues to authorize almost over 34,000 Animal Unit Months (AUM) of forage for livestock just in the Antelope HMA alone. 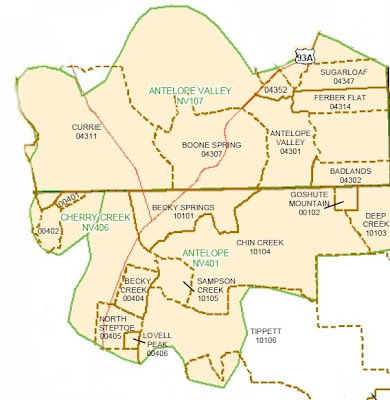 Here’s a map of the grazing allotments in the Antelope and Antelope Valley HMAs. The green lines indicate the HMA boundaries and the brown dotted lines are the grazing allotment boundaries. 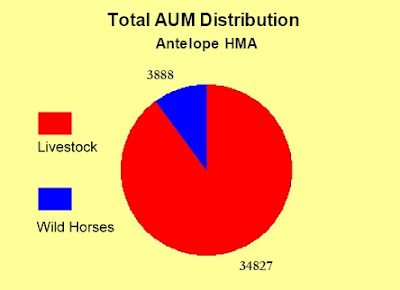 Here are the forage allocations given to wild horses and livestock in just the Antelope HMA. There’s some other problems too. The Antelope horses were rounded up in 2002 and again in late 2004. Before the 2004 round ups, BLM estimated about 950 wild horses were on the Antelope ranges yet when they finished, they removed over 1,500. After the 2004 round ups, BLM said they left 160 in Antelope and 140 in Antelope Valley and injected the mares with PZP, a three year fertility control drug that is suppose to slow down reproduction by 90% in the first year. Yet three years later, BLM reports that Antelope now has almost 1,200 wild horses again; 745 in Antelope and 436 in Antelope Valley. That’s a 40% annual reproduction rate despite the birth control and extreme drought conditions. BLM began removing wild horses on 12/10/07 and according to the Final Gather Report, they finished the Antelope Valley HMA by 12/15. In their summary totals, BLM stated that 413 were removed but when adding up the removals on the daily sheet, only 309 were rounded up, not 413. The Antelope HMA removals began on 12/16/07, finished on 1/11/08 and again, in the summary totals BLM reported removing 434 but the daily totals showed 539 were removed, not 434. Also odd were the daily removal numbers themselves as three days reported capturing 0 wild horses and five days brought in less than 20 with most of those recorded during the last week of the round ups. So if there are still 300 wild horses left in the Antelope HMA as BLM claims, then why did the numbers being captured slow down to a trickle in that last week? Why are wild horses in the area quadrupling even with birth control? Why did BLM feel the need to juggle the numbers in their reports? And why did BLM provide old photos of the range but claimed they were current if everything going on the Antelope area is on the up and up? (1) Top photo taken from BLMs Internet Adoption website, #1494, captured 1/20/05, Antelope HMA. (3) Antelope Final Gather Report provided courtesy of BLM, Nevada WH&B Lead Susie Stokke. 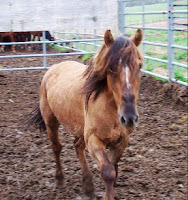 Dances with Horses: Lessons for the Environmental Fringe is the title of the five page article by Richard Symanski but you won’t get a chance to read it unless you are willing to cough up $75.00 to hear what he’s got to say. It’s a scholarly article with members-only access from the Conservation Biology magazine and opens with “When environmental activists disregard or show contempt for the facts and the rules of evidence, their intrusion into environmental issues may be perversely counterproductive”. It specifically targets “certain” wild horse advocates for misrepresenting BLMs management and is used as a reference by U.S. Fish & Wildlife Service in their latest management plans for the wild horses and burros at Sheldon National Wildlife Refuge to denigrate wild horse advocates and their involvement in trying to protect Sheldon’s historical herds. Symanski (1996) is cited by USFWS to add credibility to their inflammatory paragraphs describing wild horse advocates as presenting, “misleading information, “misinformation” and “intentionally or not…. [that] have included multiple inaccuracies, unfounded assertions, and/or misunderstandings of the ongoing and proposed programs, and their likely effects”. On the other side of the tracks, the Virginia Range horses are also in the middle of their own controversy with wild horse advocates squaring off due to Nevada Governor Jim Gibbons' appointment of Tony Lesperance as the new Director of the Nevada Department of Agriculture. Described as a long-time good ole boy, one of Directors Lesperance’s first orders of business was asking for money to remove up to 1,200 of the “starving Virginia Range horses” and then, when the fact that the Virginia Range horses weren't starving at all got in the way, the story changed to “protecting the range”. Interacting with the Virginia Range horses on a daily basis, wild horse advocates were shocked by Director Lesperance’s statements and have accused the new Director of gross misrepresentation and flat out lies to justify the round ups and road to slaughter the Virginia Range horses may face due to their “estray” status on Nevada lands. Symanski’s article, which attempts to legitimize “some” wild horse and burro advocates as elements of the environmental fringe, was based on his research of the independent census of America’s herds back in the mid-90’s conducted by the Public Lands Resource Council (PLRC) and Dances with Wolves writer Michael Blake. The PLRC adamantly maintained that the number of wild horses on public lands was significantly less than what the BLM was reporting and Mr. Blake used their results and a significant portion of his own money to take BLM to court for what he felt was gross mismanagement and malfeasance. Presiding over the case was U.S. Federal Court of Appeals Judge Royce Lambreth, a conservative Reagan appointee from Texas who ruled in favor of the BLM but went on to stir some controversy of his own after he was assigned a case handling an Indian trust fund in 1996. Based on what he learned in the Indian trust fund case, Judge Lambreth began repeatedly blasting the Department of the Interior and then BLM Director Kathleen Clark. A panel of judges ruled Texas homeboy Judge Lambreth had “gone too far” and had “lost his objectivity” and consequently voted to remove him from the case in July of 2006. Whether you’re a famous Hollywood writer, a Federal Court Judge, or just a group of wild horse advocates that bear witness to what officials are doing, it’s all too easy for the “experts” on the government payroll to declare those that oppose them as merely a “fringe element” that has no credibility or worse still, a perverse “threat” to a taxpayer extorted system they too often believe they own. As for Sheldon, USFWS states they are not really sure how many wild horses and burros still remain on the Refuge with estimates ranging from 786 to 1,547. Several attempts to get more information from Refuge managers and BLM have been greeted with silence, which will probably help them further justify advocates lack of understanding on the issues. Click Here to view USFWS Final Decision and other documents on the Sheldon wild horse and burro management plans. As for the Virginia Range horses, the KBR website (Kickin Back Ranch) with Willis and Sharon Lamm is offering extensive coverage of their take on current events, the condition of the Virginia Range horses, the range itself, newspaper articles and almost daily coverage of what is being titled, “Horse Wars”. Click Here to learn more. Other wild horse advocates joining the call for justice include singer/songwriter Lacy Dalton of the Let Em’ Run Foundation and her close friend Willie Nelson, James and Karen Mayfield of Wild Mustang Coalition, Bonnie Matton of Wild Horse Preservation League, Bobbi Royle and Betty Kelly of Wild Horse Spirit, the Alliance of Wild Horse Advocates, countless Nevada residents and even includes Antonia Umlauf Baroness von Lamatch of Austria representing the international community. Here are links to recent news and related articles about the Virginia Range horses as well. Photo of the Virginia Range horses featured above taken from KBR's website, "Horse Wars", Crooks & Liars, Article I, April 11, 2008. While on the subject of sterilizing wild horse herds, BLM has posted their Strategic Research Plan developed in 2003 on how to control wild horse and burro populations. The Strategic Plan is filled with informative insight by some our Nation’s top experts including BLM, US Geological Survey (USGS), the Biological Resource Division (BRD) and the Animal Plant and Health Inspection Service (APHIS). Lots of long titles, I know, all designed to impress the reader with the weight and authority of their statements. The plan was developed over a period of 9 months with the input of 39 subject area experts from 11 universities, 3 federal agencies (BLM, USGS-BRD, APHIS), and two state wildlife agencies as well as the Wild Horse & Burro Advisory Board, 5 expert committees in 2001, input from BLM managers and specialists assigned to the Wild Horse and Burro Program, periodic milestone decisions by the BLM, upon the research findings and direction, and earlier review of BLM and BRD research (Smith et al. 1996; Gross et al. 1999; Burnham et al. 1999; Population Viability Forum 1999; National Research Council 1991). It was upon this foundation that the strategic plan was built. Yet from the looks of it, most involved were on the government payroll, whether through University grants, careers in the Department of the Interior, appointed government approved committees or state wildlife agencies. No wild horse and burro advocates were invited with the exception of the current reigning queen of the National Wild Horse and Burro Advisory Board, Robin Lohnes who has been doing a fine, fine job for America's wild horses and burros. It was also interesting to note that in all their references, studies, and “expert committees” used for guidance, the Government Accountability Report that found BLM managers were catering to livestock interests at the expense of the horses and the law was never considered as they revved up “strategic plans” to keep the populations from reproducing. Nor were there any discussions about how wild horse and burro population targets have been set, many as old as dirt and NEVER revisited, or how the overpopulation of horses and burros is a result of decisions based on financial or political pressures that established these arbitrary numbers to appease those interests. Note the key words in there, on lands where they are protected! Despite having significantly less habitat than the 630 million acres wildlife has or only allowed on a fraction of the land that livestock is, wild horse and burro advocates actually want the wild horses and burros to be the first consideration on lands where they are protected. Apparently this crazy idea only applies to any other species on their "protected habitat" but no worries, wild horses and burros aren’t even close to being placed as a priority and that is why the “excess” populations are so desperately in need of control! Extreme, huh? Do we geld bighorn sheep? Do we brand sage grouse? Do we inject PZP into pygmy rabbits? Aren’t these species pretty much left alone to be wildlife? How is asking wild horses and burros be treated like any other wildlife species extreme? First notice that their "native ranges" are now Europe and Asia, not North America commonly refered to as the "Cradle of Equine Evolution" by equine experts NOT involved in these strategic plans. Second, notice that sustained high rates is defined as 15-22% per year. Yet, in BLMs recent assessments on wild horse and burro removals and the need to control them, figures are now being thrown out as high as 30-32% - with fertility control! And since BLM can’t seem to figure out most of the time if 100 or 1,000 wild horses are on the range, how would they know what the fertility rates are anyway? 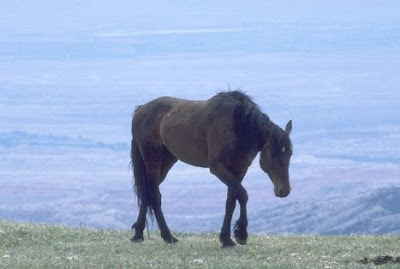 Which, back to the subject at hand, is what the Plan is mostly about – experiments on wild horse and burro populations that include such choice items as the “hormonal sterilant” used on stallions that could enter the food chain (of no natural predators) and the silicone rod implants, also suspended because of “the invasive nature of the surgery and the unacceptable stress placed on mares.” Wonder what that really looked like? Well, it’s official. Up to 25% of the stallions are being consider for castration after the round ups in selected wild horse Herd Management Areas. A draft research paper prepared by BLM titled, Options for Managing a Non-Breeding Component within Self-Sustaining Herds, was presented to the National Wild Horse and Burro Advisory Board in July of 2006 with the idea of returning a portion of stallions, now geldings, back out on to the range. Forty-nine Herd Management Areas and four Wild Horse Territories are being considered for sterilization of wild horses as a “component of the population” to help reduce holding costs. Antelope, Antelope Valley, Spruce-Pequop, Goshute, Blue Mountains, Kamma Mountains, Lava Beds, Seven Troughs, Nightengale Mountains, Shawave Mountains, Buffalo Hills, Granite Range, Fox-Lake Range, Black Rock East, Black Rock West, Calico Mountains, Warm Springs Canyon, Buck and Bald, Maverick-Medicine, Callaghan, Clan Alpine, Diamond, Diamond Hills North, Diamond Hills South, Fish Creek, Seven Mile, Little Fish Lake, Little Owyhee, Snowstorm Mountains, Monte Cristo, Sand Springs East, Sand Springs West, Nevada Wild Horse Range, New-Pass Ravenswood, Owyhee, Little Humboldt, Rock Creek, North Stillwater, Pilot Mountain, Stone Cabin, Saulsbury, Hot Creek, and four U.S. Forest Service Wild Horse Territories (WHT). Adobe Town, Salt Wells Creek, Divided Basin, and White Mountain. 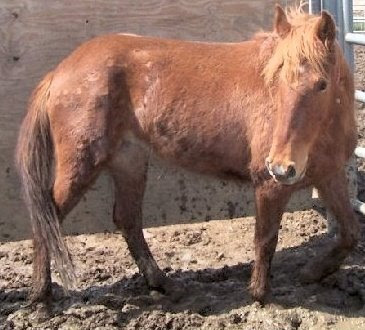 The photo is of a wild horse removed from Sulpher Springs, Utah, one of the HMAs being considered for sterilization. The Sulpher Springs wild horses are one of the few remaining herds left in America that have proven Spanish Mustang ancestry. They are also the wild horses BLM has proposed to supplement the genetically unviable Pryor Mountain wild horses with to prevent inbreeding due to established AMLs. It's the "funny math" that never adds up but somehow always seems to work when it comes to free-roaming wild horses and burros. The myth of overpopulation (and all the arguments that support it) gets regurgitated over and over again; by BLM, by state wildlife departments also known as Fish & Game, by the mainstream media and even by those who claim to staunchly support wild horses and burros and know a lot about them. When was the last time anyone read or heard about the overpopulation of excess wild horses or burros in context with everything else? We don't hear about it because the people that make these quotes with such authority would sure look stupid if they did and the decimation of our herds would be a lot harder to sell if the thriving ecological balance wild horses and burros are unrelentingly removed to "protect" were actually included in those conversations and articles. "The 27,000 free-roaming wild horses throughout the West are 1,500 more animals than the BLM has determined can exist in balance with other uses without causing damage to the range in order to protect it for over 9 million cattle, 700,000 elk, 600,000 pronghorn antelope and though they now number less than 3,000, wild burros continue to threaten habitat of the native species bighorn sheep, recently reported as topping the 50,000 mark. After World War II, one of the most puzzling questions that plagued humanitarians about the Holocaust was, how did Nazi brass so thoroughly convince their soldiers and citizens to support their agendas and atrocities? So here's another example of some other "funny math" being used on wild horses and burros to eliminate them. In 2005, BLM used complicated formulas and the Use Pattern Mapping technique to determine the "appropriate" population for the Johnnie Herd Management Area in southern Nevada. In 1995, BLM reported that 34,351 acres was measured at "heavy use" as the wild horses and burros of the area had mowed down 61-80% of the forage. Said to predominately occur around the two lone springs in the HMA, this equated to over 53 square miles and didn't include the other 30 miles reported as being used "moderately" (41-60%). So now the burning question is - how many wild horses and burros does it take to eat 60-80% of the plants in 76 square miles around the two springs? I wonder if all those horses locked up in long-term holding pens think two plus two equals five as well? 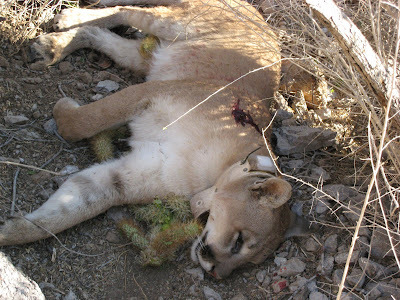 As for wild horses and burros having no natural predators, the photo used was of a mountain lion tracked and shot by using the "research only" radio collar that signaled the cat had left its approved boundaries in Arizona's Kofa Wildlife Refuge, recently targeted for a lawsuit that claims managers secretly approved plans to turn the Refuge into a big game reserve for bighorn sheep. This mountain lion is one of hundreds of predators killed each year through taxpayer-funded programs mostly used to protect livestock and big game interests. 1. All statistics, data and reports taken from the BLM Las Vegas Field Office, September 2005, Johnnie, Muddy Mountains and Wheeler Pass Herd Management Areas Environmental Assessment for Establishment of Appropriate Management Levels.